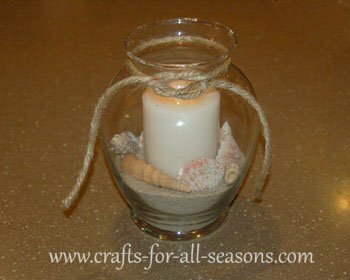 This simple seashell centerpiece is very easy to make, and will look beautiful for a summer dinner party, or for everyday. It can also be used as a summer decoration, and looks great placed on the mantle, the bathroom, or a shelf. You can put this together in minutes. You will need some sand and shells. Every time I visit the ocean (which isn't very often) I make sure I go shelling and collect a big zip lock bag of sand, and I keep this in my craft closet. There are so many things you can do with shells. I decorate with them in the summertime, using them in groupings on the mantle or in the bathroom. 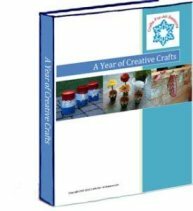 If you cannot get to the beach, most craft stores sell assorted seashells during the Spring and Summer months, and you can get sand at any discount store. 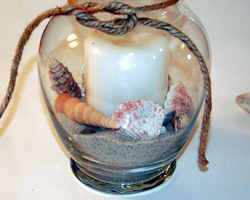 Make sure you also check out the seashell napkin rings, they look great on the dinner table along with this centerpiece! 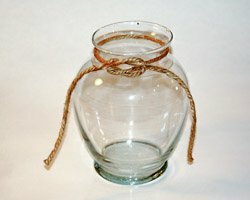 A glass vase, wide enough to place a candle in. 1. 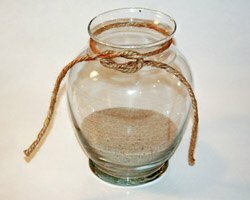 Begin by wrapping the jute around the vase, either at the top like I did, or the base (depending on the shape of the vase), and tie the jute in a square knot. 2. Add sand to the vase, filling about 1/4 of the way. 3. Add a candle to the vase. White, beige, pink, or light blue look the best. 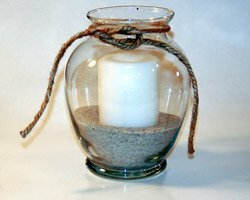 You can add a short pillar like I did, or add a votive candle and votive holder inside the vase. 4. Add seashells, and place them so the right sides are facing out. Prop some against the candle so they can be seen well. 5. The is finished and ready for display! Simple and beautiful.o the right sides are facing out. Prop some against the candle so they can be seen well.